← Book Giveaway is now Live! I wasn’t really sure what to expect before I read this book. Corey Taylor writes about his own experiences with the supernatural, his beliefs about ghosts and religion. Some of the stories date back to when he was a child, while others are more recent and an actual ghost hunt while writing the book. I think it’s safe to say at this point that if you don’t believe in ghosts or the supernatural nothing in this book is going to change your mind. And I don’t think that’s Corey’s aim. He clearly believes in what he has experienced but states at several points he doesn’t expect everyone to agree, and expects a lot of people to hate his new book. I think he just wants to share his thoughts and experiences. I gave the book 4 stars because it is a really enjoyable read. There are some creepy passages, funny passages and a couple thought provoking ones. This book is clearly going to be enjoyed more by Corey Taylor fans. He shares a couple of stories about making Slipknot albums, and a funny little story about how he ended up playing a teenagers Halloween party after a teenager won a radio competition that Corey knew nothing about. These stories are few and far between though. Every chapter of the book focuses on another experience of the supernatural. From seeing a figure in an abandoned house when he was a child to slightly more chilling events from his current house. As with any book of this nature it’s up to the reader whether to believe the writer about the events. I found it quite easy to believe all the way through. There is a lot of emotion in the writing, making it very clear that he believes this. For me that’s good enough. Corey states that he has video/audio footage and photographs to prove a couple of the occurrences. It would be great to have a documentary featuring these. 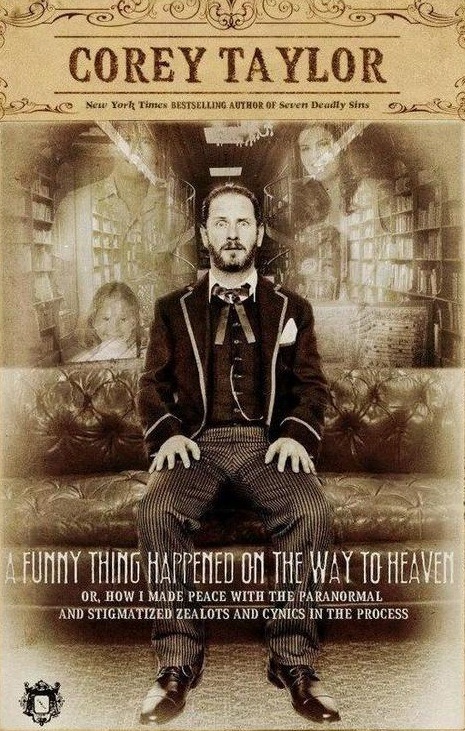 I would recommend this book to people who either love Corey Taylor (His music or comics) or believe in ghosts. If you don’t I doubt you are going to enjoy this book, but you might. This entry was posted in Uncategorized and tagged Author, Book review, Book reviews, Books, Comics, Ghost, Ghost Book, Ghost hunting, Ghost Stories, Ghost Story, Horror, Non-Fiction, Reading, Writing. Bookmark the permalink.